Lovely title page. 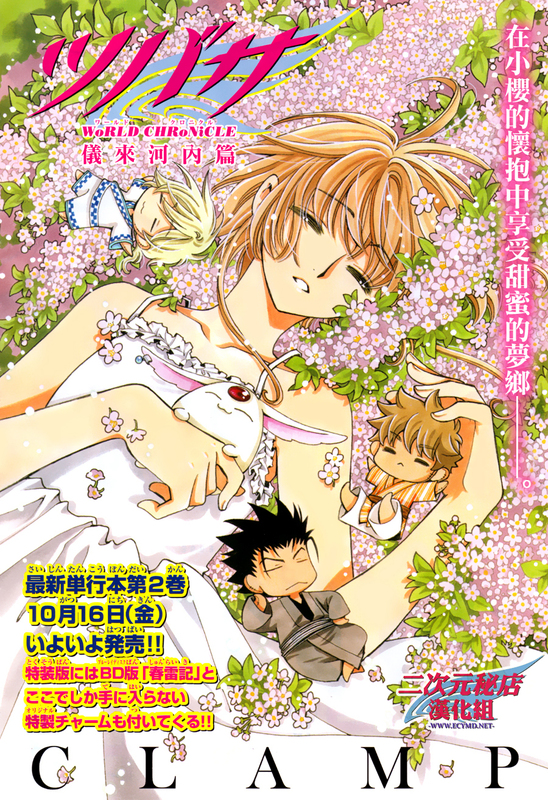 Since the boys appeared on the magazine cover, nothing less fair than to have Sakura on the title page (although the boys are there too in chibi style :3). The illustration is mirrored to Chapter 10’s title page illustration. The boys are even wearing the same clothes! This is the beginning of volume 3. Last chapter we were left with Syaoran going inside the tree and… to nobody’s surprise, it’s the clone (‘s soul?) who’s in there! What a beautiful hug Syaoran gave him! It seems like Fye and Kurogane find out Sakura is been helping Hana out in whatever they’re doing… They seem worried. The clone says important things at the end of the chapter……..! 28 pages this month. It’s more than the average but that’s only because this is the first chapter of volume 3. Be ready for some serious decrease on pages for the next chapter. 28 pages for volume 3 so far. PS: Recently I found out that the since CLAMP have moved to Kyoto they have been using digital screentone, mainly for time reasons. I just wanted to point out that that is so clear on this chapter…. It indeed seems like there is some revelation in this chapter, and all the color illustrations are great ^^ I suspect the clear file will be one of the 2, and either way, it’s fine! Other than that….do you think TWC will end with volume 3 …? That is, if we go with the idea that this is only a short extra arc, in which Clamp is just tying some loose ends from the first series + playing around with their on-going series (Holic and Gate7), and not really a sequel of TRC per se. I don’t think so… I think it’ll go for more than 3 volumes. The Nikai Kanai subtitle bugs me, though. It’s as if we’re either gonna stay a long time in this country or they will change the subtitle each time (like XXXHOLiC Rou). I see it's not just me then: I found the events in the first 2 volumes were a bit too slow (Clamp comfortably took their time to get to this chapter 13 haha~) if it has already been decided it would be a 3 vol thing. That, or it's just me feeling that way because it's a monthly release and we don't get much pages each time, so I wrongly feel like the pace is slow. They moved to Kyoto in order to escape from the crazyness that is Tokyo. However, they now have a shorter deadline (because it’s far from Tokyo), there aren’t many screentone stores in Kyoto, which made them decide to use digital screentone even though they are not digital natives. Don’t you think that it’s strange that they stopped working on the other non-Kodansha works after they moved to Kyoto? I don’t think that’s a coincidence. Maybe Kodansha is flexible enough to deal with that, while Kadokawa and Shueisha have different policies when it comes to mangakas. I have this theory that they are taking a good rest before resuming works such as GATE 7 and Drug & Drop (and why not X too, but I’m not sure about that) and right now they are only working on TWC and XXXHOLiC because they are very much “used” to it. Let’s face it, Tsubasa’s art isn’t as hard to draw as GATE 7. They are “playing it safe” with Tsubasa. They are taking their time, no rush. It’s like they think “instead of not working on anything at all, let’s work on something light, at our own pace”. They are drawing roughly 40 pages a month now, when they used to draw much more than that. Sure, they are getting older, I don’t expect them to draw 100 pages a month again, but it sure feels like they are resting. You have a point there. To be honest, they didn’t credit the main reason for not using analog screentones anymore to the lack of screentones shop in Kyoto. My previous comment might have given you that idea, but that would be wrong. From what I understood, that decision was taken for time reasons, mainly. Then later on, they were talking about how the new gerenations or artists are more digital and some art materials are hard to find nowadays. They mentioned that color tone is almost impossible to find these days and then Ohkawa added that in Kyoto there aren’t many screentone shops. Of course, that could affect indirectly, but like you said, they could order it online, I suppose. Yes, I suppose all the recent CCS buzz is taking a lot of their time as well. Also, we will be getting more color illustration of TWC next month! This is definitely to celebrate the release of vol02 on October 16th and we are enjoying it 🙂 In october we will be having 3 new TWC artworks: the cover of vol02, the bluray case cover and the chapter’s splash page. “Center” color unfortunately doesn’t necessarily means double pages. They used the same name (center) for Chapter 13 as well but we’ve got only 1 page. A “tumbler” is a termical bottle/cup. Like those big starbucks ones? So there will be a service to get one of these.